Starting small usually makes for a great start. It’s not a rocket science so you can start doing it right now. You will be amazed how easy and simple is to free more space in your home. #1 on our list is a small hidden container right inside the kitchen that can do miracles. 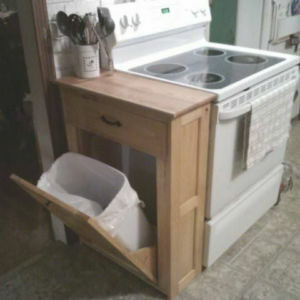 Whether you use it as a garbage bin or to keep some items hidden, its privacy can be very useful. For example hiding sweets from the kids/or the adults. Trash & Recycling storage is maybe not the most fun solution to talk about, but it is an important one. Usually in small apartment, there is a small kitchen. That being said, there is probably not a lot of counter space for you to work with when cooking or prepping any sort of meal.